The holiday season will soon be upon us and many businesses are hoping to capitalise upon an increased customer base during the coming weeks. However, we also need to keep in mind that competition is stiff throughout this time of the year and customers can also become quite picky. This is why embracing the proper advertising techniques is a crucial factor to take into consideration. While online sales and support are certainly important, it is critical to stress the role that traditional forms of retail signage play within the commercial environment. Let’s take a look at some sure-fire Christmas suggestions for your business. Many Christmas signs will often display a traditional appeal. This makes a great deal of sense; particularly if your store caters to families or the older generation. Traditional signs are associated with a timeless flavour and as a result, this very same quality can be passed on to your business. While they may be fashioned from modern materials, the fact of the matter is that they will still be able to echo old-world sentiments. Remember that business owners can always choose to use these concepts in conjunction with other possibilities such as vehicle graphics or even printed Christmas-inspired stickers. The only real limits are associated with your imagination. Why not truly grab the attention of onlookers with a bright and flashy LED sign? This type of signage is great if your business happens to be located with a commercial centre such as a shopping mall, as it is highly visible. As always, you are fully capable of choosing the style and design of the sign itself. Bright colours, a cost-effective lighting system and superior levels of craftsmanship all await. 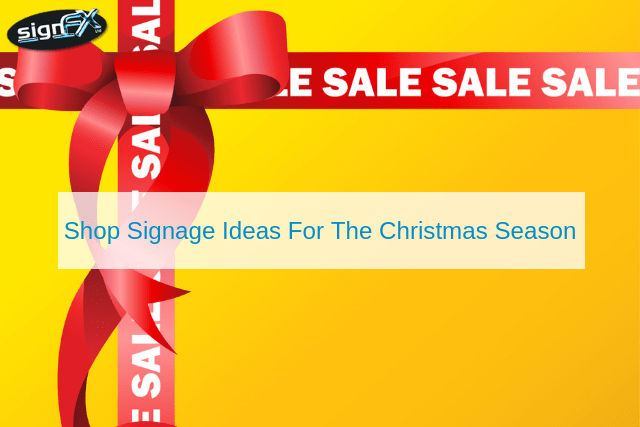 The Christmas season provides you with an excellent opportunity to advertise your business. If you are able to present it in the right light, holiday shoppers could very well become loyal year-round customers. Please contact Sign FX to learn more.